Bright and showy but not overly difficult. Use three or a section - a “Trombonist’s Holiday” for a new era. See the separate page for Fanfare in B-flat under "Orchestra"
Two movements: “I - Annunciation” - Bright! “II - “Reflection; Confrontation” - A quiet beginning to a stormy ending in three intense minutes. All four parts are interesting; Trombone 1 is a blow! Challenging! Finally, a playable, legible, affordable & easily obtainable orchestral version of this classic concerto. For large chamber orchestra or full orchestra. Sounds great right out of the box - buy it! "Horton's orchestration is masterfully crafted. It captures the essence of the original concerto, while showcasing the wonderful colors and textures of the symphonic orchestra. Bravo!" 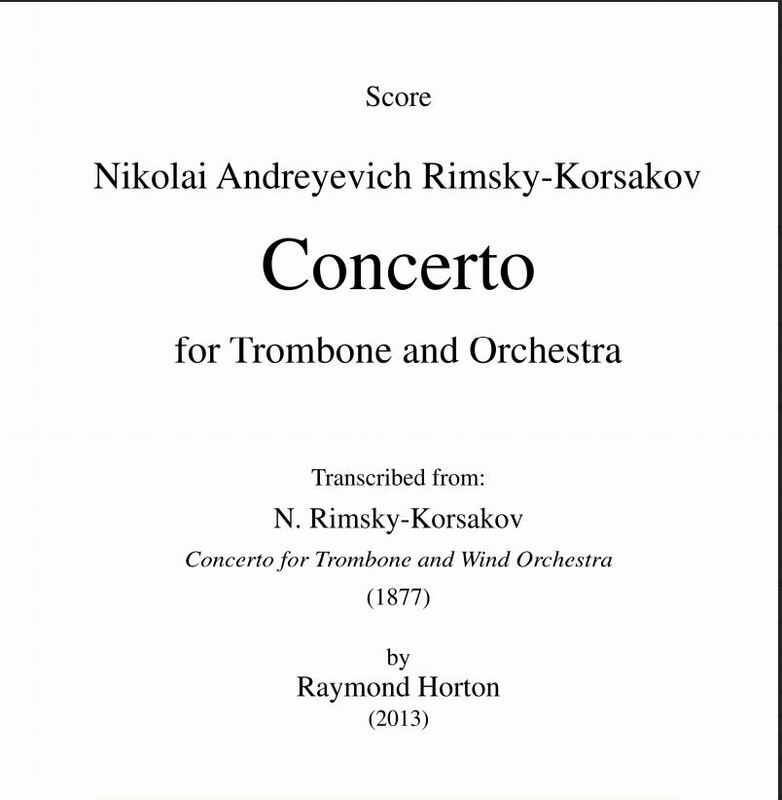 "It was my great pleasure to premiere Raymond Horton’s new orchestration of Rimsky-Korsakov’s Trombone Concerto. The score and parts are easy to read and Mr. Horton has done an exemplary job in transferring the wind ensemble colors to the more homogeneous sound of full orchestra. The balances between soloist and ensemble have been astutely handled in the orchestration and, in performance, the work sparkles with verve and vitality." Michael Gesme, Music Director - Central Oregon Symphony; Professor of Music at Central Oregon Community College and Chair of the Department of Fine Arts and Communication. Traditional, arranged Horton: "Were You There"
William Byrd / Horton: "The Carman's Whistle" One pro said "The best trombone trio I've ever played!" J. Wilbye / Horton: "As Fair as Morn" Playable by good high school students. Enjoyable. J. Bennet: “Two Madrigals” One slow, one fast. Slow one is easy and beautiful. William Byrd / Horton: "The Carman's Whistle" Same as the trio, but less difficult, fuller-sounding. William Byrd / Horton: "Look Down, O Lord" Playable by high school students, great for church. Di Lasso / Horton: "Carmina Chromatico” Incredible study in modulation - slow and dramatic! Traditional French / Horton: "Let All Mortal Flesh Keep Silence" Beautiful tune, beautiful treatment. Trombone profs from a national workshop audience called Cimarron for this before it was available - really! Byrd at his ﬁnest. Euphs and tubas can use suggested embellishments to make this a tour de force.